Scooping and pouring. Toddlers pour, and dump toys (or cereal, a cup of water, a bin of diapers...) as soon as they discover that they can. 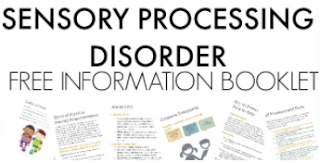 It's a developmentally appropriate skill that happens as mobility develops. When little ones pick up a bowl or cup and turn out the contents on the floor, it may be frustrating to a mama that's just picked up all of the toys in the house for the third time, but it is such a great function that is the occupation of play. Pouring and dumping is discovery and exploration of gravity, weight, muscle control, cause and effect, and self-awareness. Not only are toddlers discover what they can do by pouring , they are learning about their environment while working on so many skills. Today, I've got a fun fine motor and visual perceptual motor activity that children can work on at as toddlers, preschoolers, and school-aged levels to improve the precision of skills, practice math, and discover skills, all through scooping, pouring, and transferring small items. This post is included in my 31 Days of Occupational Therapy series where I'm sharing tips and tools with items you can likely find in your home. Today, we're talking scooping! This post contains affiliate links, but you can use items that you already have in your home. We used plastic scoops found in food like cocoa powder, coffee, or iced tea mixes. For the scooping, we used plastic beads that we already had, however, this activity will work with any small item such as rice, dry beans, field corn, pebbles, or sand. Use what you've got on hand to make this activity free! Scooping small items is important in development and refinement of motions needed for managing utensils during self-feeding. This is an important independence step in the Toddler range. Older kids will find a scooping and pouring activity fun and relaxing. Adding in learning objectives makes this play activity a bonus. This activity is very easy to set up. Simple set out a bowl or tray of beads and scoops in different sizes. Shoe your child how to scoop, transfer, and pour the beads into another bowl. Just be sure to keep a close eye on your little one. It can be easy for them to forget they are scooping beads and not cereal! As with any activity found on this blog, use your best judgement with your children. This activity, especially is a choking hazard for young children. If you are concerned with your child placing beads in their mouth, simply don't do this one and put it on hold for a few weeks of months. Note: Use edible materials for this activity with Toddlers. Dry baby cereal or broken up finger foods (like Cheerios) are great. 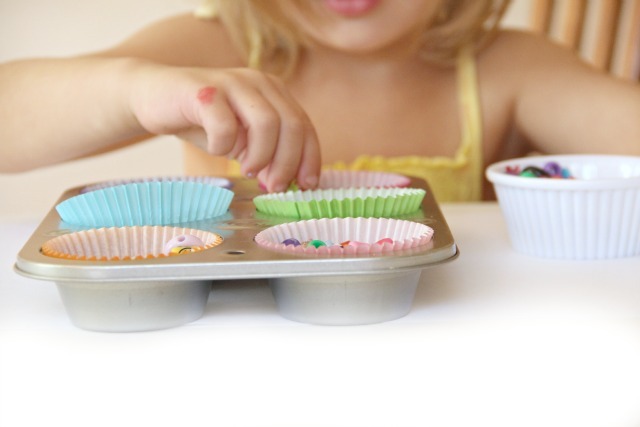 For Toddlers, they will be focusing on simply scooping and pouring with accuracy. Hand dominance is an area that they can be working on, depending on their age. Simply holding the scoop is an activity for grasp development. 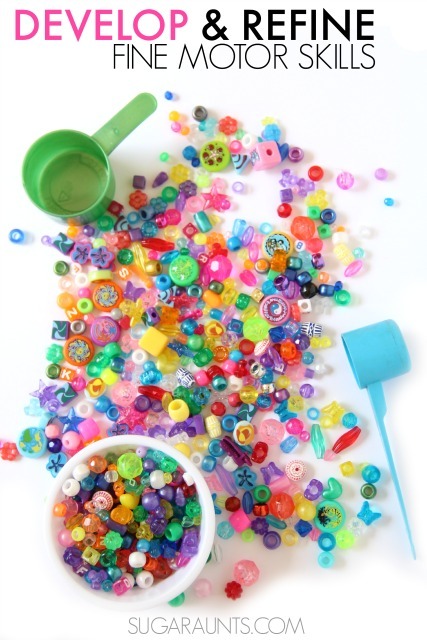 Grasping pellets (bead-sized items) is a fine motor skill that typically develops around 11 months. Children at that age can grasp small pellets with their thumb and the pad of their pointer finger, with their arm positioned off the table. Holding a scoop with either the dominant or non-dominant hand typically develops around 13 months of age. You can show a child of this age how to dump the dry cereal from the scoop into a large tray. Kids in the Toddler range would benefit from scooping and pouring using larger scoops or small cups. In order to scoop food when eating or scooping like in this play activity, kids need precision of very small wrist motions. Moving the wrist from side to side is called radial deviation (moving the wrist towards the thumb side) and ulner deviation (moving the wrist towards the pinkie finger side). In addition, slight wrist extension (the wrist slightly bent back in the direction of the back of the hand) is needed to accurately and efficiently scoop and pour. Toddlers will use an exaggerated elbow motion when they first begin an activity like this one and until those small wrist motions are developed. At around 15 months, Toddlers will be able to scoop and pour from a small scooping tool, although as soon as 13 months, many children are able to complete this activity. Managing a spoon during self-feeding happens around this age, as well, as children scoop food and bring it to their mouth. It is messy, but they are able to get food to their mouth. Using a scoop to move beads or spoon to eat develops with more accuracy at 15-18 months. At around 12-13 months, children will begin to develop unilaterality in hand dominance. They will begin to show a preferred hand that manipulates as the other, non-dominant hand assists in holding the bowl or tray. (Other kids don't define a hand dominance until later. You can use this activity in the preschool years to work on hand dominance!) You will want to use a wide tray or large bowl for improved accuracy in both scooping and pouring. Try using a spoon for scooping the cereal pellets, too. 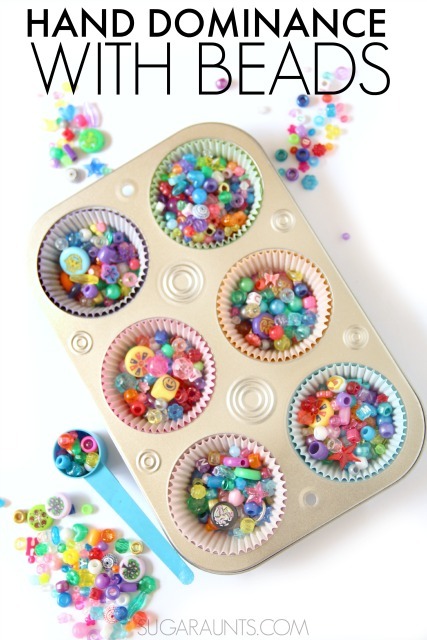 Preschool aged children can refine their scooping and pouring activity using beads. I've found this activity to be very calming for children. They love to watch the beads as they fill the scoop and watch them fall into the bowl as they pour. 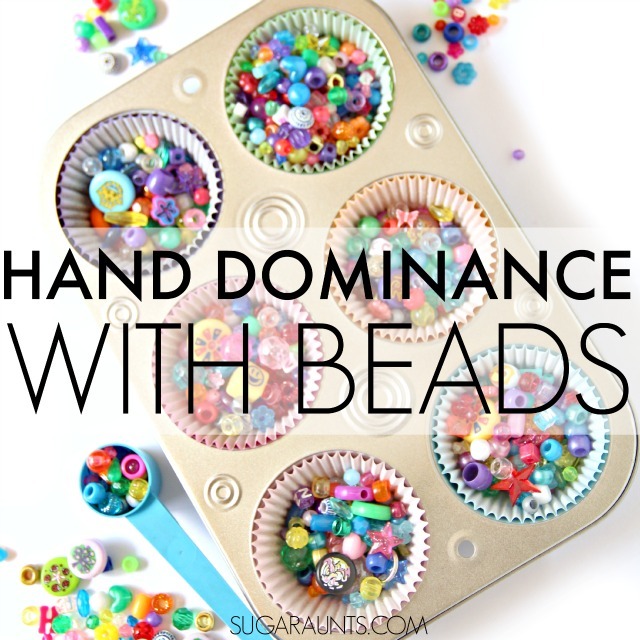 Other children can become overly excited by the visual stimulation of scooping beads and soon the beads will scatter all over the table. You can eliminate mess by doing this activity in a large bin like an under the bed storage bin. While Toddlers begin to show a hand preference, a true hand dominance doesn't typically develop until 2 to 3 1/2 years. That is such a huge age range! That is because while a toddler can show a hand preference, hand usage is experimented with during different activities throughout the Toddler and Preschool years. There is typically variability in hand preference as toddlers and young preschoolers poke, pick up, throw, color, and play. 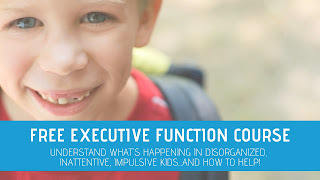 Another consideration is that often times, kids of this age are influenced in which hand they choose by position of toy, location of the adult or playmate, method materials are presented, and sitting position of the child. True hand dominance may not be completely integrated in the child until around 8 or 9 years of age. Knowing all of this, use this activity to practice and play while working on a hand preference. If your child shows a preferred hand, set up the activity to work on scooping with the typically used hand. If your kiddo uses their right hand most of they time in natural situations (You will want to watch how they do things on a normal day and in a variety of activities. ), then set the bowl of beads on the left side of the child and the scoop on the right side. Show them how to scoop from left to right. 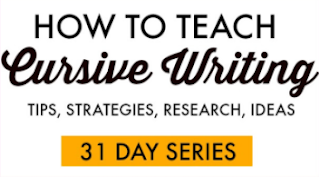 A set up like this one also encourages the left-to-right motion of reading and writing. For school-aged kids, use this pouring and scooping activity in math. Ask them to predict how many scoops it will take to fill different sized cups and bowls. 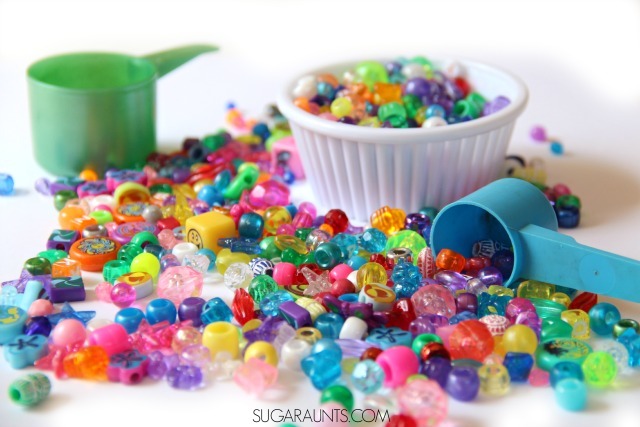 For added fun, use clear glass measuring cups to the beads to be scooped into. They can count the number of scoops and see if their prediction was correct. Incorporate addition and subtraction as they move scoops of beads from one container to another. 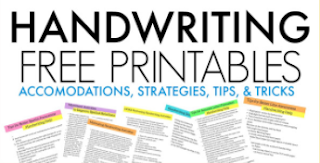 Scooping works on important skills like bilateral hand coordination, including using the non-dominant hand to assist as they would in holding the paper in writing, coloring, and cutting with scissors. Use a variety of materials for scooping besides beads to work on fine motor control and dexterity. Other ideas include wet sand (heavier and great for coordination and strength) and a light material like foam pillow filler (for more coordination and dexterity). Visit our Toddler Play, Preschool Play, and School-Aged Play pages for more developmentally appropriate play ideas.